Wash the spinach thoroughly. In a pan, add the butter and turn on the heat source. As soon as the butter melts, add the garlic and let it roast for a minute. Add the spinach. Stir well. Reduce the heat to minimum and cover the pan well. The spinach will cook in its own juice. When the spinach is cooked, add the salt. 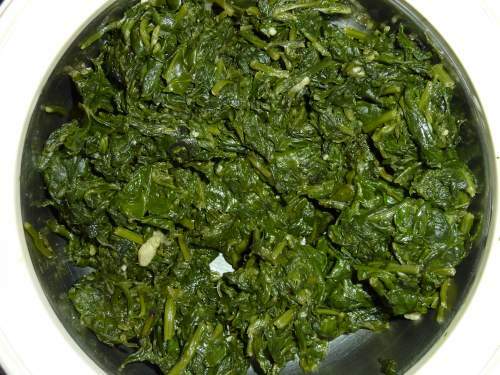 If you like your spinach dry, then increase the heat and dry the spinach. Your green vegetable is ready in a jiffy.